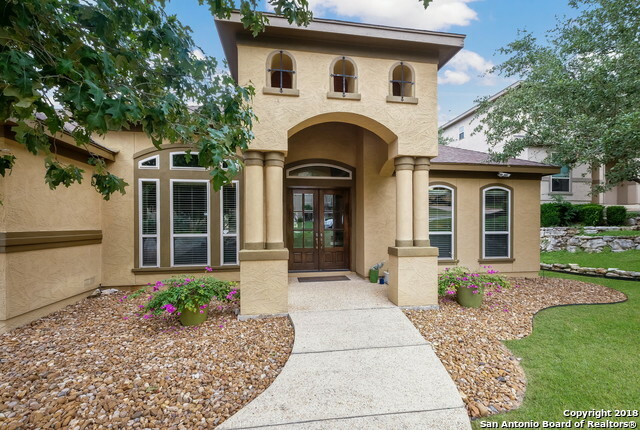 All MESAS AT CANYON SPRINGS homes currently listed for sale in San Antonio as of 04/22/2019 are shown below. You can change the search criteria at any time by pressing the 'Change Search' button below. 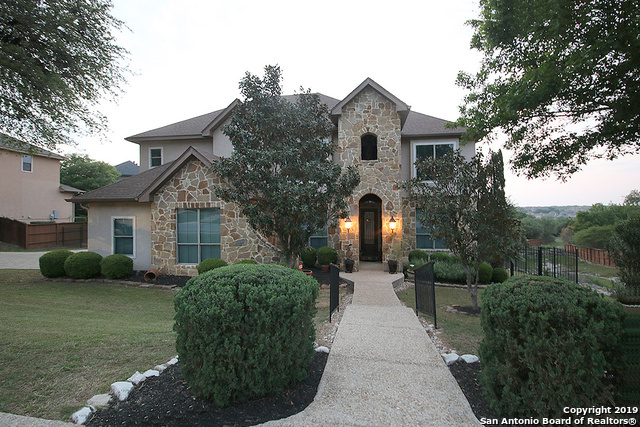 "Look no further for the expansive home of your dreams. Located in the gated community of the Mesas at Canyon Springs, this home boasts 5 amply sized bedrooms and an abundance of space for work, play, and relaxation. Enjoy the well manicured back and front yards with a pool area that invites you away from the stress of daily activities. Walking up to the front of the home, into the courtyard and through the front double doors, you are greeted by a split staircase and heart and home warming firepl"
"GORGEOUS CUSTOM HOME IN STONE OAK GATED COMMUNITY*OPEN FLOORPLAN WITH HIGH CEILINGS*GOURMET ISLAND KITCHEN FEATURES KITCHENAID STAINLESS STEEL APPLIANCES WITH GAS COOKTOP, 2 CONVECTION OVENS, WINE COOLER & BREAKFAST BAR*CUSTOM KITCHEN CABINETS WITH UNDER CABINET LIGHTS*MASTER DOWN WITH LARGE BATH& WALK-IN DESIGNER CLOSETS*WIRED THEATER ROOM READY FOR SPEAKERS,SCREEN & PROJECTOR INSTALL*GAMEROOM UPSTAIRS*WIRED WITH CAT 5 ABUS FROM THEATER ROOM TO ENJOY APPLE AIRPLAY IN MULTIPLE ROOMS*ROOF INSTAL"
"Elegant 1 Story plenty of Room For a Martini Pool or A larger Pool and Jacuzzi 4 Bedrooms 4 Baths & Study & Game Room. Wood Floors flowing through this open floor plan. Granite and Stainless Steel make this a grand kitchen & Separate Extra Area to put a wine cellar/Grotto.Master Bedroom has amazing sitting Room for coffee & Cocktails.His & Her vanities & Jacuzzi tub in the huge Master Bath. Game Room/Man Cave & Wet Bar for gracious entertaining. Guest Suite & 3+ car Garage.Elegant Living Await"
"In prestigeous gated Mesas@Canyon Springs,you'll find this beautiful custom & very well maintained property on sprawling landscaped 1/3+acre lot*Floorplan includes lg.master & guest bedrms,2 full bathrms & office ALL down*Upstairs-3 additional bedrms-each w/bathrms,storage spaces & game room.1 bedrm is secluded & w/full bath & craft/office room*Oversized granite countd.kitchen& butlers pantry perfect for entertaining while double deck in the backyd allows for fun outside activities.Come see,love"
"Stunningly beautiful 1 stry home in prestigious Canyon Springs. Oversized side entry 3 car garage w/storage & resin floor. High end finish out w/impeccable workmanship & quality. Vaulted ceiling w/surround sound. Open concept floor plan w/NO carpet- all wood or tile. Granite kitchen feats. custom cabinets & gas cooking. Spacious master w/tub & sep. vanities. Sep. wings for master suite and 2ndary BRs. Game room, guest suites, office, fireplace on enclosed porch-this home has it all! 0.8 mile to "